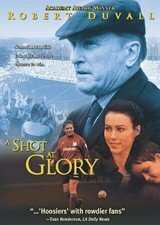 Robert Duvall is the manager of a struggling Scottish soccer club who is forced by American owner Michael Keaton to sign a big-name player in order to keep the team in the loyal hometown they've had for 100 years. But the new star brings his share of baggage, not the least of which is his former marriage to Duvall's daughter. With Ally McCoist, Kirsty Mitchell, Brian Cox. 114 min. Widescreen (Enhanced); Soundtrack: English Dolby Digital 5.1; Subtitles: English, Spanish; scene access; theatrical trailer.